The TCL 6-Series is a great 4K LED TV, especially when you take into account the affordable pricing. 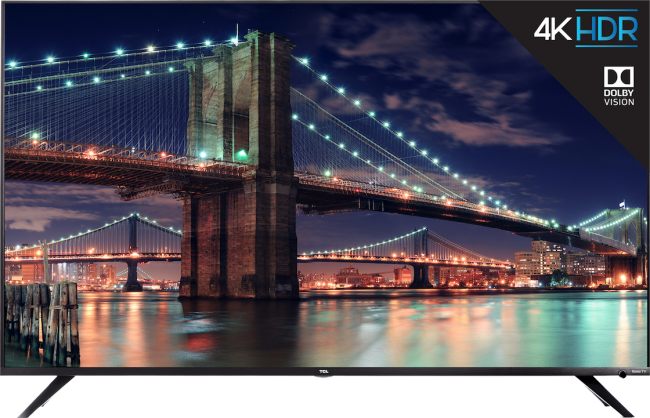 With 55” and 65” models, the 6-Series shines with excellent picture quality, high-dynamic-range imaging (HDR), easy-to-use smart TV features, and a nice, small remote with voice-control features. 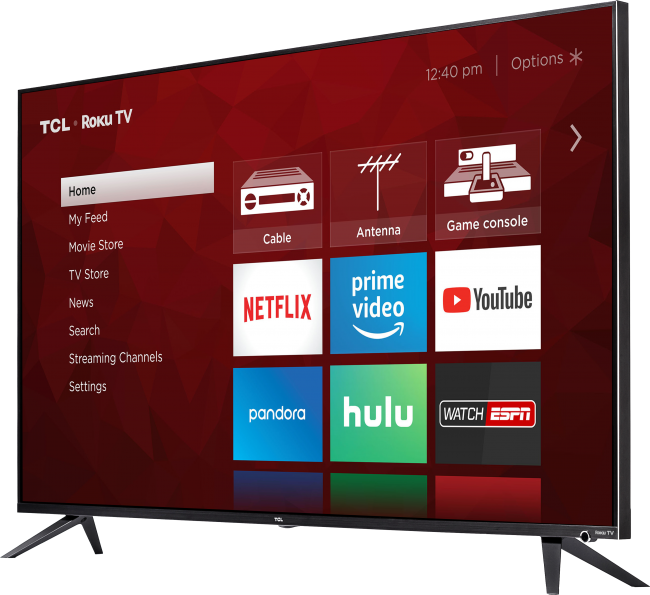 Starting at $649.99, the TCL 6-Series deserves a top spot on every holiday shopping list. TCL’s reputation has grown exponentially in the past few years, as evidenced by their 23 million TV sales in 2017, which ranks TCL within the top three best-selling TV brands in the world just behind Samsung and LG. 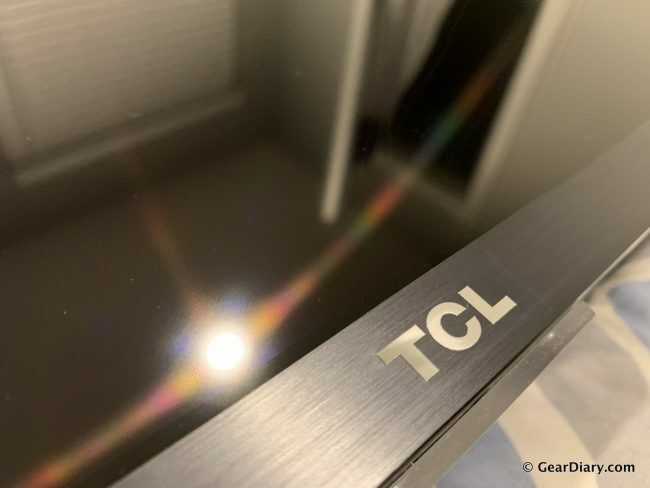 TCL is one of three global TV brands that are vertically integrated, which means that they produce the panels and core components of their own TVs rather than purchasing them from someone else and simply assembling the pieces. This gives TCL the ability to produce TVs efficiently and pass the cost savings onto their customers. We’ll be focusing on the 6-Series TVs in this review, which is TCL’s premier line of 4k HDR TVs. However, TCL has a number of other models, including the 3-Series, 4-Series, and 5-Series, which you can check out at the respective links. The rear of the unit and all of the included accessories. TCL’s 6-Series TVs feature 4k UHD picture quality and Dolby Vision HDR. The 6-Series TVs are powered by Roku OS, which delivers a ton of streaming content without the need for additional hardware and wires. The 6-Series TVs also feature Wide Color performance with TCL’s NBP Photon technology, which produces a vibrant color palette. The 6-Series comes in 55” (55R617) and 65” (65R617) models. In this review, I’ll be discussing the 55” model, which is model #55R617. The only difference between the two, other than the obvious screen size, is that the 55” model has 96 contract control zones while the 65” model has 120 contrast control zones. While this difference is important to note, I would expect that performance does not vary too much between the 55” and 65” models. The design of TCL’s 6-Series TVs is fairly basic but classic in that it won’t look outdated in years to come. You might not mistake it for a top of the line TV, but that’s not what TCL is all about. The front bezel is metallic and about 0.47” wide, which is not ultra-small but not noticeably large. The stand is wide, made out of solid metal, which makes it strong and very sturdy. The single button on the front of the TV that turns on the TV and accesses the main menu. The 55” 6-Series TV measures 48.5” x 30.9” x 10.7” with the stand attached and 48.5” x 28.1” x 2.9” without the stand. The 55R617 weighs about 38.2 lbs with the stand and 37.1 lbs without the stand. The 55” model is compatible with a VESA hole pattern of 200mm x 200mm with an M6 x 16 screw size. The rear of the TV is made out of two parts. The top mainly contains the panel, which is the thinnest part of the TV. The bottom contains all of the electronics and is the thickest part of the TV, at around 2.95”. It’s not the thinnest 4k TV on the market, and it will protrude off of the wall a bit when wall-mounted. 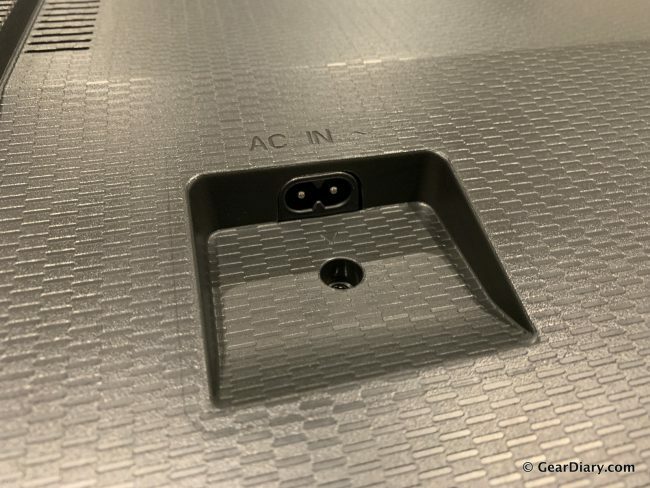 The recessed AC-in jack on the opposite side of the inputs. The overall build quality feels fairly good. There are no loose pieces or gaps between parts, which would be indicative of a lower-end unit. 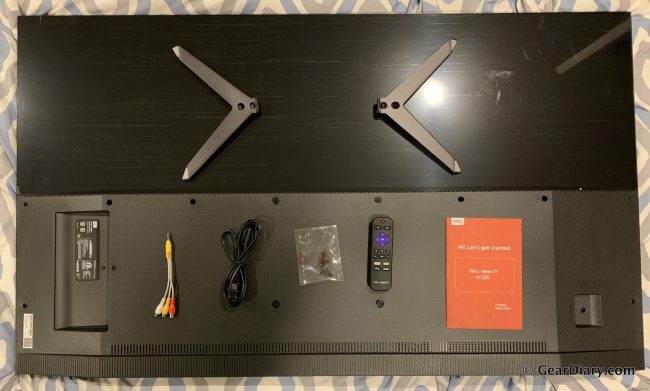 There is no cable management built into the rear of the TV, so you’ll want to be sure you purchase cable ties or a wall-mount with built-in cable management if you want the rear of the TV to look clean. All of the inputs are facing out to the side of the unit, rather than the back. This ensures you don’t run into the issue of your cables hitting the wall if you choose to wall-mount the TV. There are a total of three HDMI inputs, one USB input, and one composite input. TCL includes a composite break out adapter in the retail box. There’s also a tuner (cable/antenna) input and an Ethernet adapter as well. As far as outputs go, there’s one digital optical audio out and one 3.5mm analog audio out. There’s also built-in Wi-Fi connectivity, which works very well. I was connected wirelessly the entire time I tested the unit and never had an issue. A look at the inputs on the side of the TV. 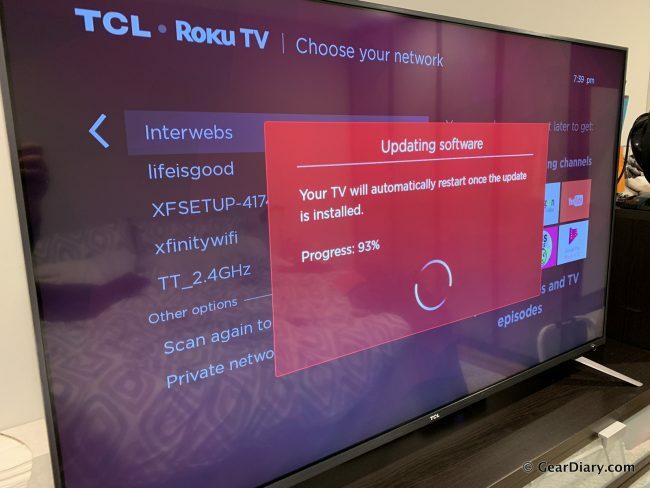 While the TCL 6-Series TVs include a decent number of inputs, you may start to run out of inputs quickly if you use the TV in your main entertainment center. 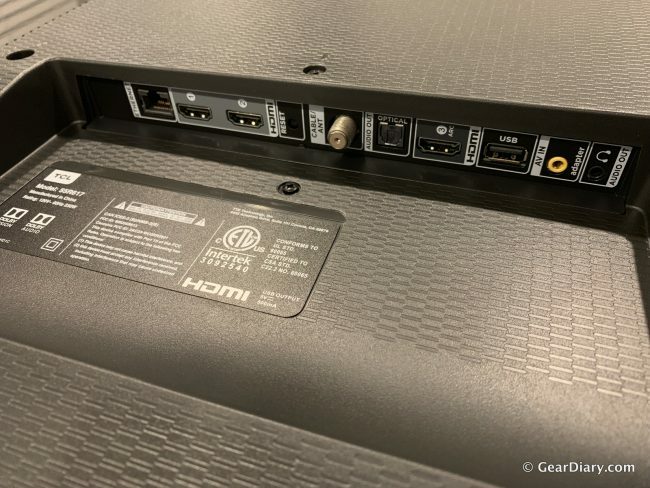 If you have a cable box, streaming box, and one gaming console, your HDMI inputs will be full. 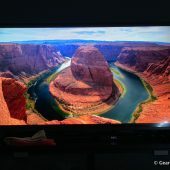 I was instantly impressed by the picture quality of the 6-Series TV. 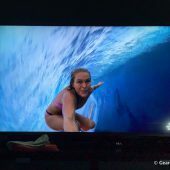 The first thing I did after setting up the TV was to play a 4K YouTube clip by GoPro which I found in the included 4K Spotlight app. The contrast was excellent, the colors were vibrant, and the blacks were fairly uniformly black. The screen is very bright, especially when viewing HDR content. What assists with the excellent contrast is the local dimming of the full array backlight. The full array backlight with local dimming allows the screen to darken blacks without losing much brightness. There is minor clouding around moving objects on a dark background, which is to be expected. The LED panel is very bright, which is good for daylight viewing; however, the viewing angle is less than ideal. In order to view the picture properly, you’ll want to view it from as close to straight on as possible. The screen has a semi-gloss finish that diffuses reflections across the screen instead of concentrating them in one location. Watching in a bright room is less than ideal due to the reflections, however, I’ve seen much worse. Watching in a dim or dark room will always result in the best possible viewing experience. The inclusion of Dolby Vision HDR makes the TCL 6-Series one of the best budget-friendly 4K TVs on the market. 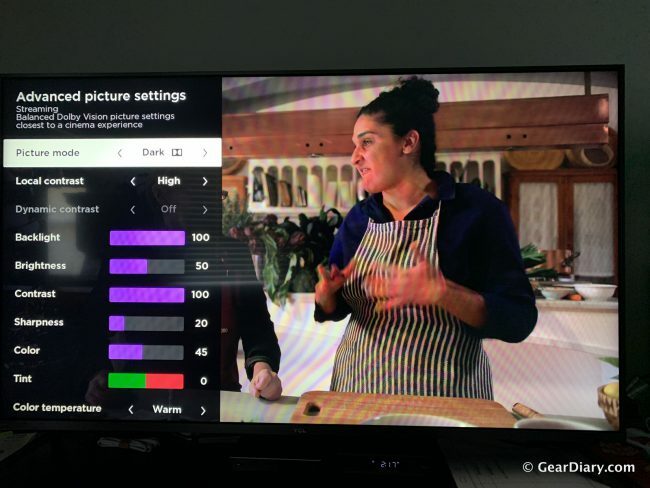 HDR expands the color palette and contrast range, using dynamic metadata to optimize the picture on every screen on a frame-by-frame basis. Impressive stuff. I’ve spoken to friends who work at HBO who say that HDR is the single most exciting advance in visual technology. They say that HDR improves the viewing experience even more than the jump from 1080p to 4K resolution. Motion is handled well on the TCL 6-Series. Response time is good and motion is fairly smooth. 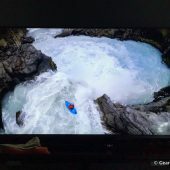 I’ve watched a few movies on our TCL and can say that I’ve been impressed with the way motion is handled. Nothing seemed blurry or jumpy. TCL includes a feature called motion interpolation in the 6-Series, which helps make lower frame rate content look like it was filmed at 60 fps. This creates an effect called the Soap Opera Effect, which can make content originally recorded on film look like it was recorded on digital video. It’s a jarring effect that hurt the viewing experience, so I ended up turning this feature off. You can do so by going to the Advanced Picture Settings menu and turning “Action Smoothing” off. You have the option of turning Action Smoothing on to low, medium or high as well. 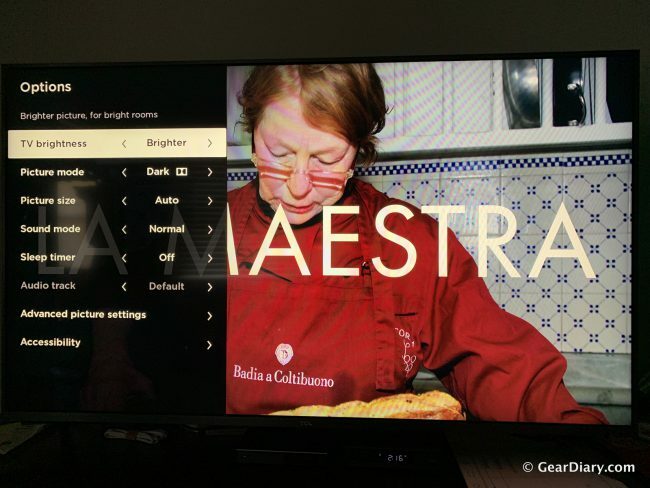 Some TVs are difficult to operate; they have large, confusing menus that you have to navigate through in order to change settings or find the streaming features. 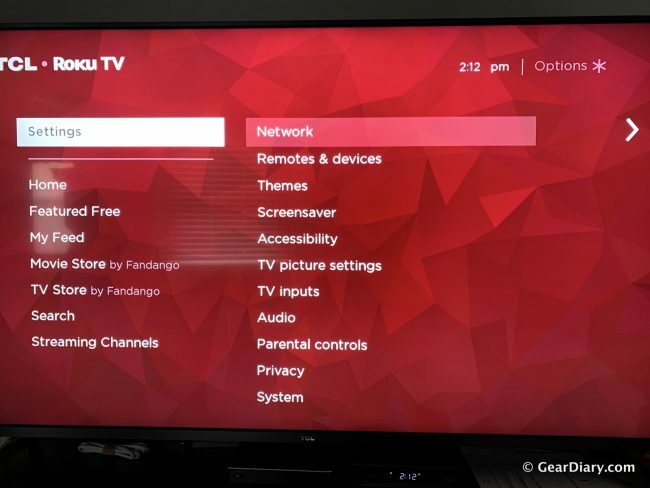 The Roku TV platform is incredibly easy to use, while not being overly fancy. Navigating through the menus is smooth and enjoyable; there is no lag or jumpiness at all. Another great feature of Roku TV is that it is compatible with Roku’s mobile app which allows you to cast the audio from your TV to your smartphone so that you can listen to your TV with headphones for silent late night listening if your partner is sleeping. 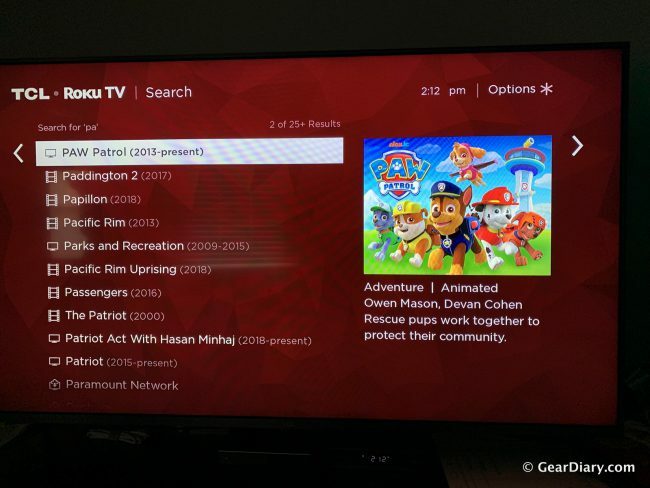 The Roku mobile app also allows you to use your mobile phone as a remote, quickly search streaming channels, search with your voice, as well as cast photos, videos, and music to your TV. 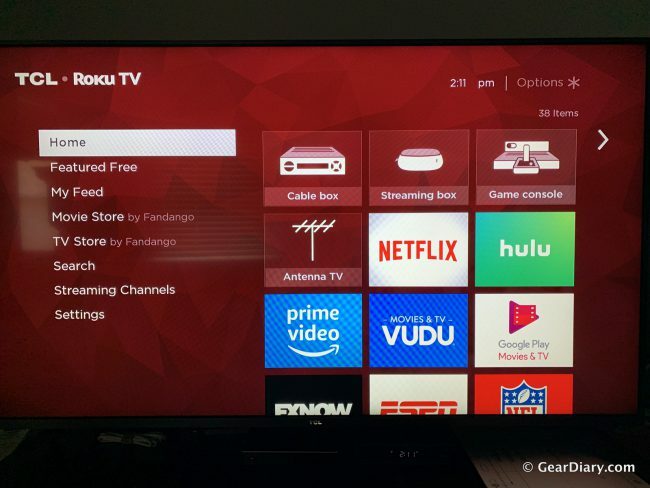 Roku’s selection of streaming channels/apps is extensive. There are hundreds of apps available for download and many of them are free. There are some streaming apps like DirectTV Now, YouTube TV, or Philo that require subscriptions. The app performance is great, as I didn’t notice any hesitation navigating through them. 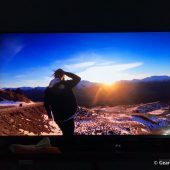 One of the apps I love is the free included 4K Spotlight app, which collects a number of free and paid 4K content to quickly and easily scroll through. One thing to note is that there are ads on the home screen, however, they are pretty unobtrusive and easy to ignore. These ads are generally for Roku devices or other streaming channels. 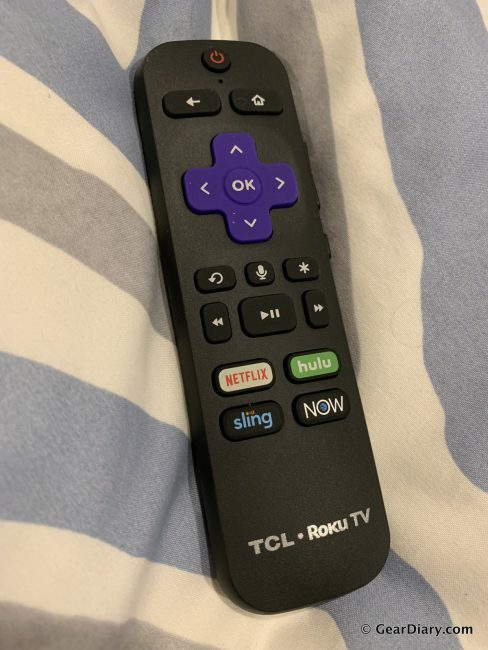 The included remote will be familiar to anyone who’s owned a Roku in the past. It’s a small, nicely designed remote that has a pared-down button layout compared to what you may be used to, however it works very well and feels great in the hand. There’s a power button at the top, followed by a back button and home button. Next, you’ve got directional buttons and the “OK” button, followed by a “skip back” button, voice control button, asterisk button, which is the “menu/options” button, the play/pause, rewind, and fast forward buttons. 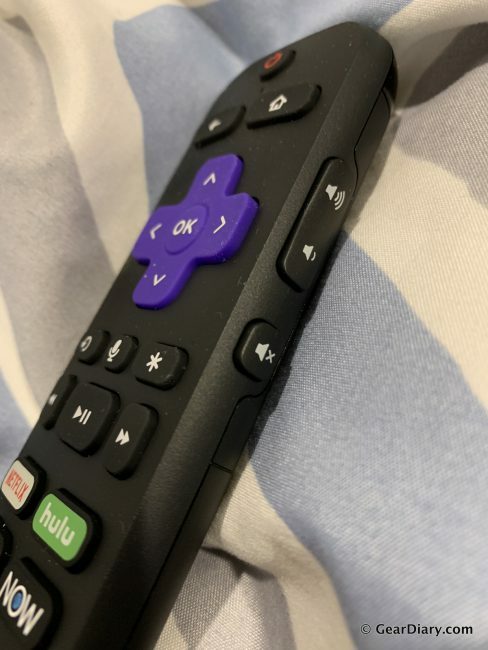 Finally, at the bottom of the remote, you’ve got shortcut buttons to access Netflix, Hulu, Sling, and DirectTV Now. 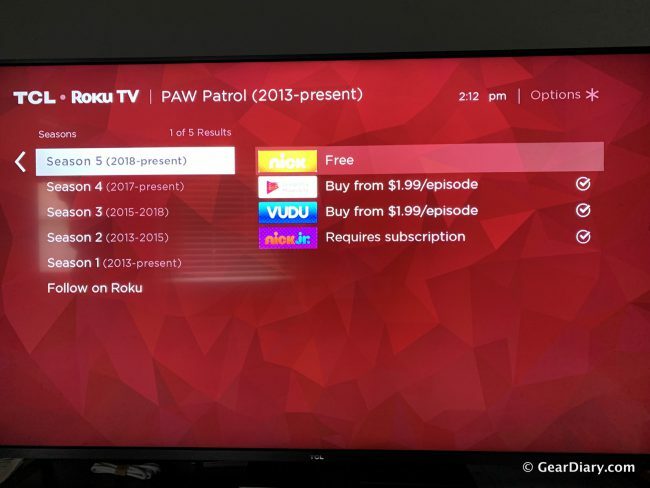 If you’re not a subscriber to these services, they’ll be useless to you, but they’re a quick way to access some of the more popular Roku apps. Also, on the side of the remote, you’ve got the volume up/down buttons and a mute button. You can use your voice to control the remote, which can be a nice way to quickly open up an app or switch to a different input. 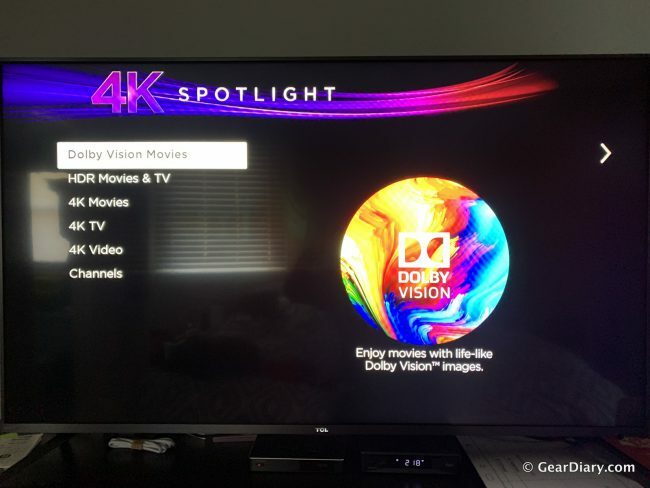 I’m going to try to make this simple: Can you find a better 4k TV? Yes, I’m sure there are plenty of expensive TVs out there that put out a gorgeous picture in a variety of situations. However, for $650, you’re not going to find anything that compares to the picture quality and smart features that the TCL 6-Series offers. 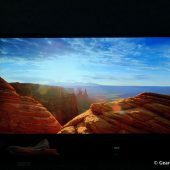 With its 4K resolution, Dolby Vision HDR, full array backlight, Roku TV smart features, and more, you’re going to have trouble convincing me that you’ve found a better value 4K TV than the TCL 6-Series. 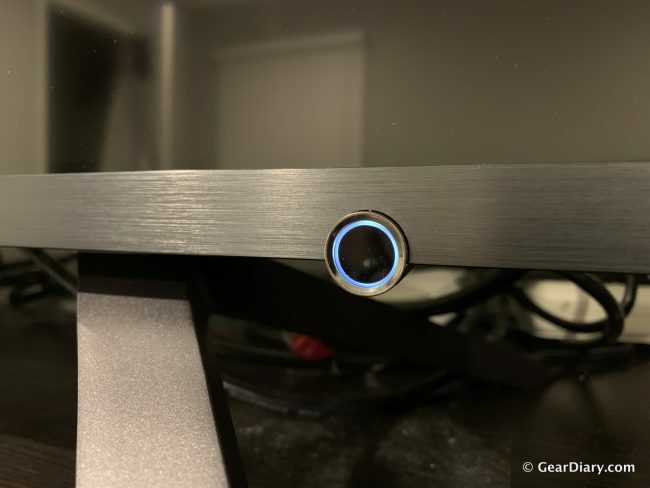 While the sound quality out of the built-in speakers isn’t fantastic, that’s not a deal breaker for me — you can always just add a soundbar later if it bothers you. And yes, the TV is a bit bulky compared to pricier models, but again, you’ll make some sacrifices if you’re looking for a really good, yet lower-priced TV. I can confidently say that if you purchase the TCL 6-Series and you value the smart TV features, you’ll be a happy customer. 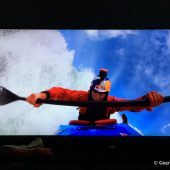 While I was once skeptical of TCL’s offerings, they’ve made me a believer thanks to the 6-Series. 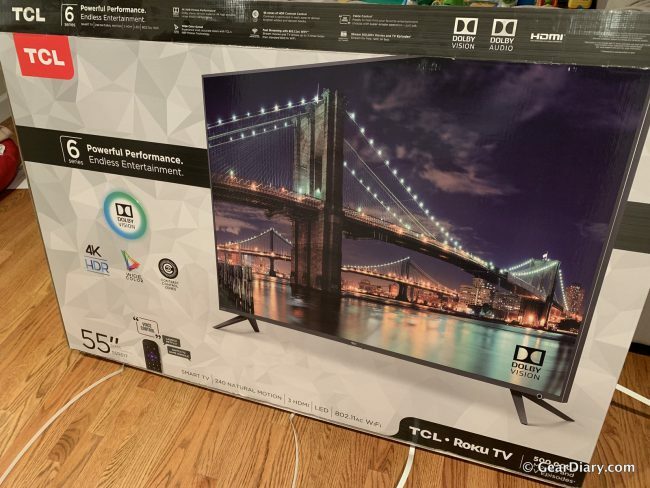 You can purchase the TCL 6-Series TVs in 55” and 65” from Amazon [affiliate links]. 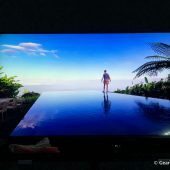 Source: The TCL 6-Series 4k TV was a manufacturer supplied review sample.